The school board finalized more budget cuts on Feb. 21, finally balancing the deficit. During the 2017-2018 school year, the board fell into a $2.4 million deficit pit. Meetings to address the deficit began in early October, and are still continuing into late February. Being $2.4 million in the hole, the board needs to make cuts for operations to return to normal for the 2019-2020 school year. Many of the proposed cuts effected the high school, causing students and staff to become uneasy and voice their opinions. With $1.081 million in cuts already made as of Dec. 20, the school board still needed to cut $735,435 to balance the budget. To be in compliance with school board policy number R 5.4, the board must also attain a minimum five percent fund balance, which the board did not reach on their Dec. 20 meeting, or their Feb. 21 meeting. $1.014 million from the 2019-2020 school year budget in a matter of hours. 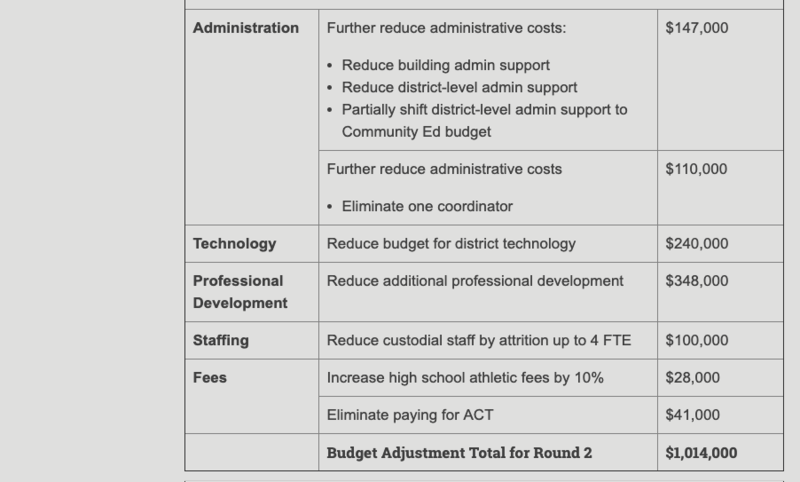 The reductions included reducing administrative costs by $257,000, reducing the district technology budget by $240,000, reducing additional professional development by $348,000, reducing custodial staff by up to 4 FTE to save $100,000, increasing high school athletic fees by 10 percent to bring in $28,000, and eliminate the district paying for the ACT, saving $41,000. These cuts would allow for $265,000 to go towards the board’s five percent fund balance, but the board is still short of their goal.